The High Court has rejected a judicial review brought by a man with terminal motor neurone disease to challenge the current law on assisted dying, in a judgment handed down today. The High Court has rejected a judicial review brought by a man with terminal motor neurone disease to challenge the current law on assisted dying, in a judgment handed down today (Thursday 5th October 2017). The judgment does confirm that the courts do have the authority to make a declaration of incompatibility between the 1961 Suicide Act and human rights legislation. The Noel Conway v Secretary of State for Justice case, which is supported by Dignity in Dying, was heard at the High Court in July 2017 before the courts’ summer recess. Noel and his legal team will now assess their options for appeal. 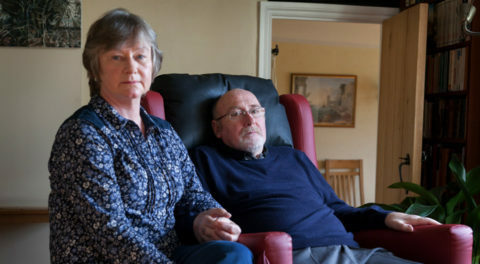 Noel Conway, 67, a retired college lecturer from Shropshire, was diagnosed with amyotrophic lateral sclerosis (ALS), a form of motor neurone disease (MND), in November 2014. His condition is incurable and he is not expected to live beyond the next 12 months. Noel feels that he is prevented from exercising his right to choice and control over his death under the current law. He fears that without a change in the law he may be forced to suffer against his wishes. Noel, supported by Dignity in Dying, instructed law firm Irwin Mitchell to bring this case to fight for his right to have the option of an assisted death when he is in his final six months of life. “I am deeply disappointed by today’s judgment and fully intend to appeal it. The experiences of those who are terminally ill need to be heard. “This decision denies me a real say over how and when I will die. I am told the only option I currently have is to effectively suffocate to death by choosing to remove my ventilator, which I am now dependent on to breathe for up to 22 hours a day. There is no way of knowing how long it would take me to die if I did this, or whether my suffering could be fully relieved. To me, this is not choice – this is cruelty. “As I approach the end of my life, I face unbearable suffering and the possibility of a traumatic, drawn out death. Travelling to Switzerland is no longer a viable option and I cannot put my family or doctors at risk of prosecution by asking for their help here at home. Knowing I had the option of a safe, peaceful assisted death at a time of my choosing would allow me to face my final months without the fear and anxiety that currently plagues me and my loved ones. It would allow me to live the rest of my life on my own terms, knowing I was in control rather than at the mercy of a cruel illness. “Whilst we are disappointed with the judgment, it does confirm that the courts have the authority to declare the current law inconsistent with our human rights. Noel does not accept the death that the current law forces him to have, and neither do we, which is why Dignity in Dying will support Noel every step of the way to take this case on to the appeal courts. “How can it be more ethical or safe for Noel to have his ventilation withdrawn under the current law, with no formal safeguards, than for him to request life-ending medication within the multiple safeguards proposed through his case? This is paradoxical. “It is clear the current law does not work, when every eight days someone from this country travels to Dignitas; every year 300 dying people end their own lives at home in England and Wales; and thousands more experience unimaginable suffering right to the bitter end. Terminally ill people deserve to be listened to. They are, after all, the true experts on how they want to die. “The law being proposed in Noel’s case is not a step into the unknown – it has been proven to work safely and effectively in Oregon, USA, for 20 years and now almost 57 million Americans live in states where they could request assisted dying if they were terminally ill. Similar laws are due to be debated in the Australian states of Victoria and New South Wales before the end of the year. Dying people in this country are being let down while the rest of the world moves on. “Today’s judgment is obviously disappointing and on behalf of Noel we will now seek permission to take the case to the Appeal courts. Noel Conway, 67, from Shrewsbury, was diagnosed with amyotrophic lateral sclerosis (ALS), a form of motor neurone disease, in November 2014. His condition is incurable and terminal – he is not expected to live beyond the next 12 months. Noel feels that he is prevented from exercising his right to choice and control over his death under the current law. He fears that without a change in the law he may be forced to suffer against his wishes. Noel is bringing this case against the Ministry of Justice to fight for his right to have the option of an assisted death when he is in his final six months of life. Dignity in Dying is supporting Noel’s case. Retains the ability to undertake the final act(s) required to bring about their death having been provided with such assistance. Noel attended the High Court on March 21st to request permission to bring a legal case. On Thursday 30th March 2017, a decision was handed down denying permission for the case to proceed. Noel Conway’s legal team successfully appealed this decision on Tuesday 11th April 2017. A directions hearing on Monday 22nd May 2017 determined the procedural arrangements for the High Court hearing, which took place Monday 17th July 2017 for three and a half days, presided over by three judges. The courts closed for summer recess on Monday 31st July, and reopened on Monday 2nd October. A written judgment was handed down at 10.30am on Thursday 5th October, rejecting the judicial review claim.